Los Angeles - Aug. 29, 2013 – A Cedars-Sinai team of researchers led by principal investigator Dan Gazit, PhD, DMD, has been awarded a $5.18 million grant from California’s stem cell research agency to advance stem cell technologies in segmental bone defects, a complex medical problem caused by large portions of bone tissue loss. The research team will use the grant from the California Institute for Regenerative Medicine to develop a novel approach to treat segmental bone defects without grafting bone. 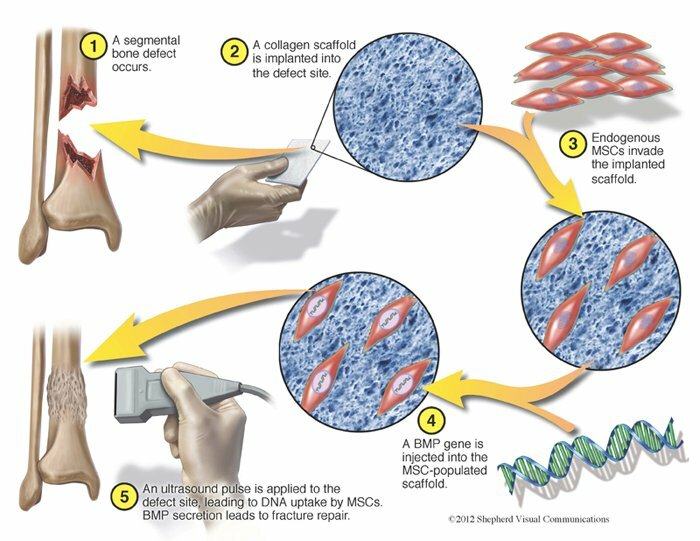 Stem cells will be recruited to the fracture site using a collagen matrix and then a bone-forming gene will be directly delivered to the stem cells using an ultrasound pulse (see Figure 1). If successful, researchers will be able to proceed to clinical trials. Bone grafting can be complicated because healthy bone, typically from the pelvis, is not always available for harvest. In the lab, Cedars-Sinai researchers have shown an alternative approach by modifying stem cells already residing in fracture sites. Gazit, who is overseeing a large collaborative group that spans different departments and institutions, will work in collaboration with several leading Cedars-Sinai experts, including co-principal investigator, Hyun Bae, MD, medical director and director of education at the Cedars-Sinai Spine Center and an orthopedic spine surgeon, Zulma Gazit, PhD, Wafa Tawackoli, PhD, Gadi Pelled, PhD, DMD, and Dmitriy Sheyn, PhD. “This research is a prime example of collaboration among leading scientists, bringing scientific implications directly to patients,” said Bruce Gewertz, MD, surgeon-in-chief, chair of the Department of Surgery, vice president for Interventional Services, vice dean of Academic Affairs and the H & S Nichols Distinguished Chair in Surgery. Svendsen and Gewertz state that funding from the California Institute of Regenerative Medicine has transformed Cedars-Sinai’s translational programs as well as the pace at which stem cell science and clinical therapies are moving forward within the state of California. The California Institute for Regenerative Medicine was established in November 2004 with the passage of Proposition 71, the California Stem Cell Research and Cures Act, providing $3 billion in funding for stem cell research at universities and research institutions. Since its founding, the institute has awarded 12 grants to Cedars-Sinai for a total of more than $38.6 million.